Clear Small and Medium Blocks have etched centering lines for accurate placement of your images, a wavy edge for a no-slip grip, and are crystal clear. The stamps cling like magic. 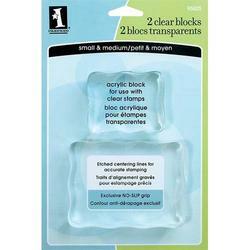 These blocks are ideal for smaller images and projects like Tags and place Cards. Block sizes: 3.6875" x 2.6875" (medium) and 2.4375" x 1.9375" (small).